Does your family love breakfast for dinner? Sweet potato waffles would be great for breakfast OR breakfast for dinner. In North Carolina, sweet potatoes are our number 1 crop! Although we have lots of farmers growing sweet potatoes, they are also pretty easy to grow in your backyard. I mainly try to grow things that thrive with benign neglect so these are perfect for me. My kids and I planted sweet potato splits and walked away. That’s it! 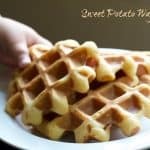 We had a bumper crop of sweet potatoes this year and I am loving putting sweet potatoes in different recipes – like these sweet potato waffles! If you have a favorite waffle recipe, you can use it and add some sweet potato. Easy peasy. Just add some liquid to make it the right consistency for pouring into your waffle maker. 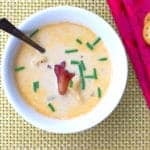 For this recipe, I had gluten-free Bisquick in the pantry. The recipe on the back of the box is pretty foolproof. Mix, milk, eggs, oil. That’s it. I microwaved a couple of small sweet potatoes and mashed them up and added them to my batter. Does it seem too easy? It really was. Have you ever microwaved sweet potatoes? I don’t use the microwave too often but, once in awhile, it is such a lifesaver! First, poke your sweet potato 5 or 6 times with a fork or knife. I like to wrap my sweet potato in a paper towel, put it on a plate, and set the timer for 4 minutes. 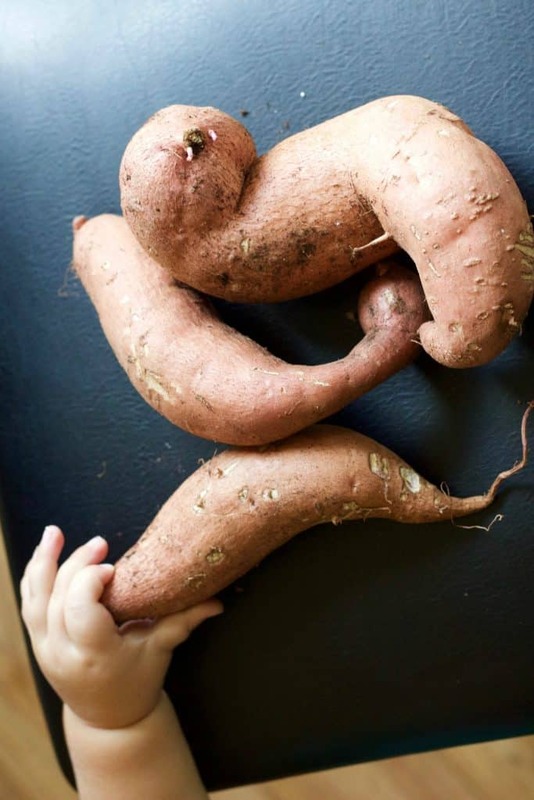 Poke the sweet potato to see if it is getting soft. Microwave for 1 to 4 more minutes. Smaller sweet potatoes will, obviously, take a shorter amount of time! After you have microwaved your sweet potato, scrape the insides of a small potato into your waffle batter. I made two batches of waffles and used 1 1/2 small sweet potatoes in each batch. 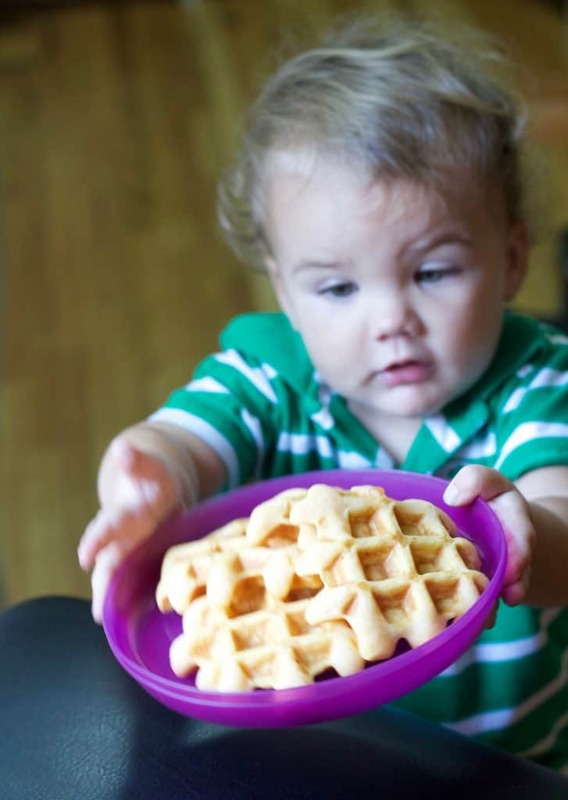 These sweet potato waffles will be delicious for breakfast or dinner! We were eating them for dinner – it was that kind of day – so I cooked up some delicious Italian sausage links to serve with our sweet potato waffles with sliced apples. Lots of local love on our plates these days! Isn’t fall the best? 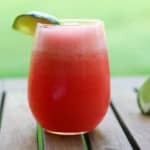 For more sweet potato recipes, check out the NC Sweet Potato website! 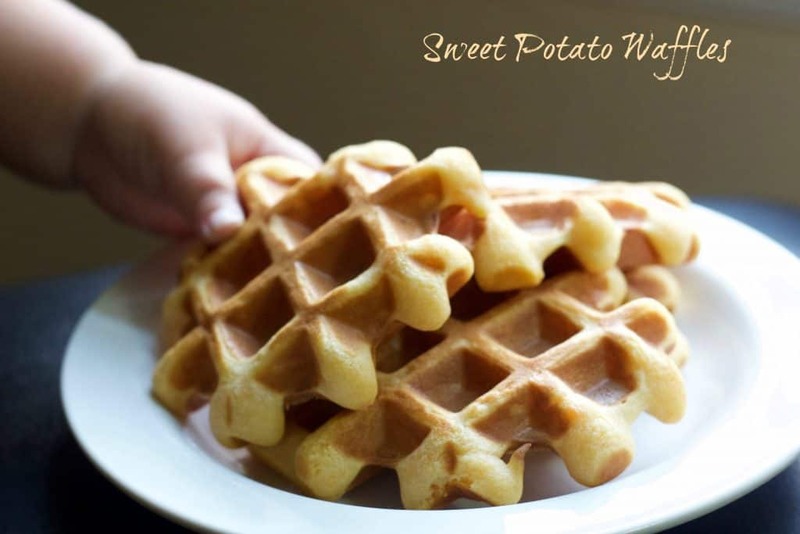 Add a mashed sweet potato to your favorite waffle recipe for a delicious breakfast or dinner! 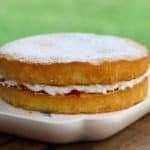 Combine flour, milk, oil, and egg in a mixing bowl. Mix together. Add mashed sweet potato. Mix again. Thin with additional milk if batter is too thick to use in your waffle maker. Cook! 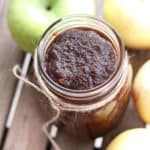 Serve with syrup and butter or apple butter! Enjoy. I love your little sweet potato waffle thief!!! Adorable. 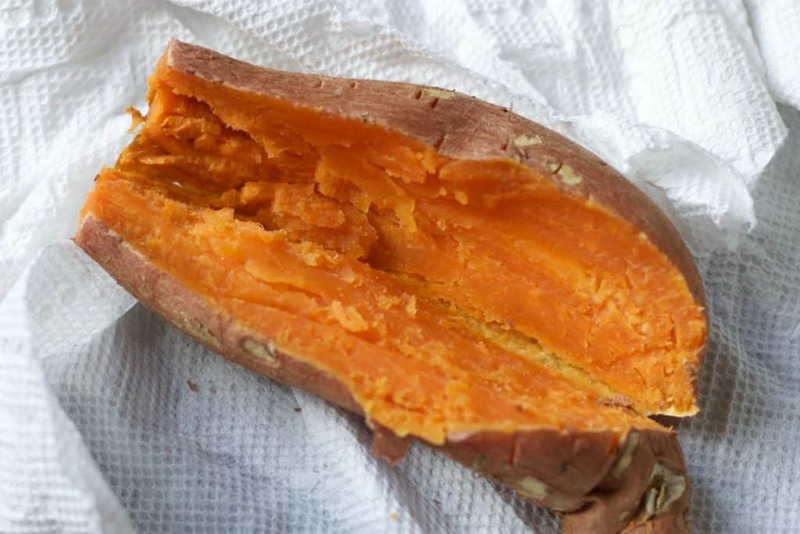 This is a great simple recipe and I love that you grew your own sweet potatoes!!! We’re getting a frost tonight here in NH and my Charlie (10) just came in with a fistful of carrots he pulled from the garden. Something so wonderful about living off the land whenever we can! Yep, fall is the best! Yes! You should be fine to use plain bisquick for these waffles!